We know mowing the lawn is not the most exciting chore so we’ve tried to make selecting a suitable lawn mower easier for yourself. We’ve gathered data and reviewed our top 10 best lawn mowers which we’ve put into an easy to read table highlighting the features shown above. 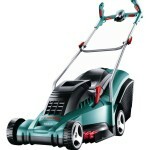 Please only use the table as a guideline as the best lawn mower for your garden will depend on various factors. Some lawn mowers may not be able to cut very close to the edge making your garden look incomplete, to cut all the way to the edge and to tackle stubborn weeds check out what grass strimmers can help you complete your tasks. Furthermore, if you also have overgrowing hedges that need to be cut then we suggest buying an electric hedge cutter to speed up the process. 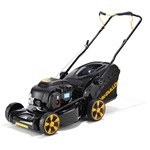 Hover – Ideally used for smaller gardens and, uneven surfaces and banks. Hover lawn mowers floats on a pocket of air allowing it to cut in any direction with their blades which will either be metal or plastic. Very lightweight making it easy to carry and store away. 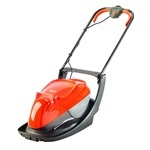 Rotary – Suitable for small, medium or large lawns depending on the cutting width. 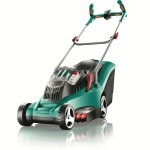 Operates with a very high speed rotating blade underneath which makes it suitable for longer grass as well. 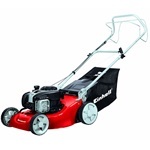 Some models are battery powered allowing it to be cordless which can be much more convenient if you have a really large lawn. 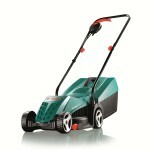 Petrol – Used usually for larger lawns and longer grass, petrol lawn mowers are cordless as it is powered by an engine. They are much more powerful than rotary and hover lawn mowers. 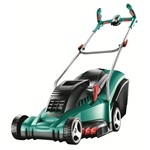 Power type – Most lawn mowers will be powered by electric but petrol lawn mowers operates on petrol therefore will not be connected to a mains. 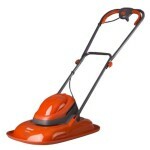 Alternatively, if you want to keep fit and be more green then you can opt for a hand push mower. Watts – This can be measured as the amount of electrical energy the lawn mower will use, so the higher the wattage the more powerful the lawn mower is. Cordless electric lawn mowers will be measured in volts and again the higher the voltage the more powerful the lawn mower is. 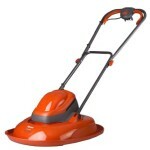 Corded or cordless– Choosing a corded or cordless lawn mower can depend on the size of your lawn. 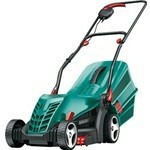 Corded lawn mowers allows you to have unlimited runtime as it’s powered by the mains and it’s also generally cheaper. On the other hand cordless lawn mowers are ideal if your yard is big and a corded cable won’t allow you to reach as far, it’s also easier to manoeuvre as there’s no cable trailing behind. Cordless lawn mowers are powered by a rechargeable battery pack which has a limited runtime so if you don’t complete mowing the lawn before the battery runs out then you’ll have to recharge it before you can start again. If however, you prefer a corded electric lawn mower but the cord length is not long enough then you can buy a portable petrol generator which will give you electricity anywhere. It’s also useful for other power tools and camping trips. Cutting width – The cutting width is how wide the lawn mower mows the lawn. The wider the cutting width the less time it would take to cut the grass. Height of cut – This is how low or high you want the grass cut. The height you choose generally depends on your own preference. Height cutting positions – The height cutting positions relates to the height of cut, because the height of cut is between a range, the height cutting positions tells you how many different positions there are between that range. Grass combs – The ability for the lawn mower to cut right up to the edge.